This week’s SATURDAY SIX takes a look at Top Six New Food Options in Universal’s Diagon Alley. 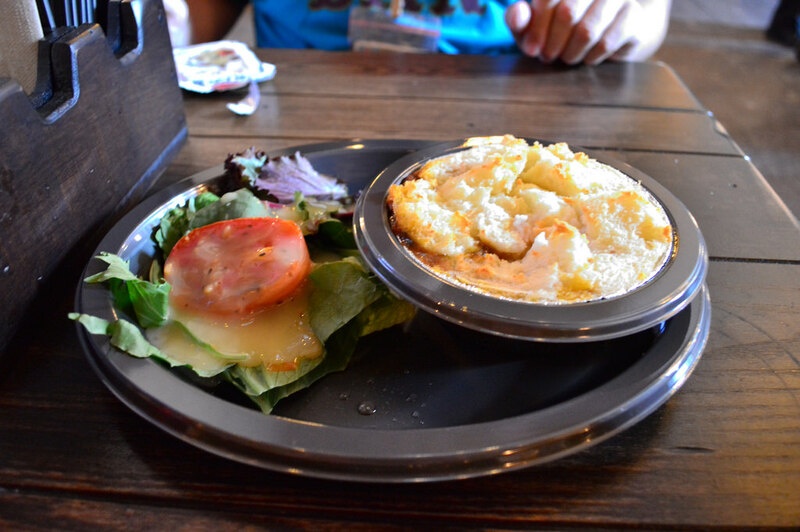 We began our mouthwatering journey into Diagon Alley two weeks ago when we went through the best new drinks and continued last week by looking at the best new snacks. 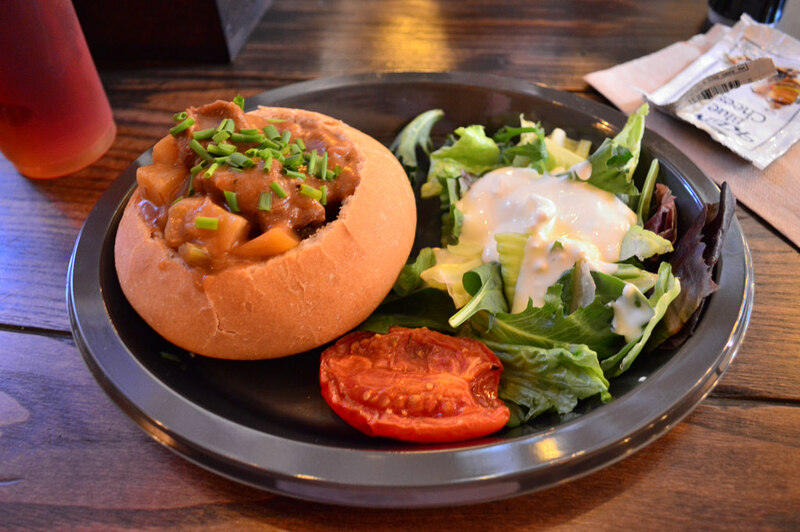 Today we finish up our glutonous trilogy by hopping into the Leaky Cauldron and checking out the newest food options inside the Wizarding World. 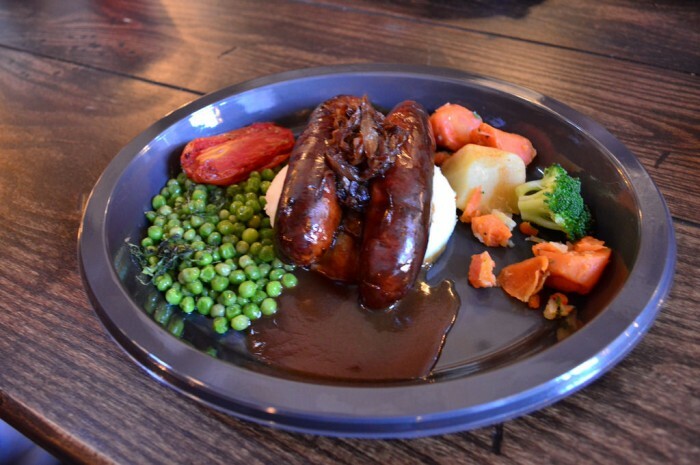 Offering traditional British pub fare, the Leaky Cauldron serves a menu that differs wildly from the standard hamburgers, chicken fingers and pizza that we’ve become used to inside the theme parks. Our All-Star blue ribbon panel of experts sat down and tried everything, and today we’re counting down the best of the best…. So there you have it: the Top Six New Food Options in Universal’s Diagon Alley. See you next weekend for the latest edition of the SATURDAY SIX, where we are going to look at the construction capital of the world, Downtown Disney. If you had fun, be sure to check out The Magic, The Memories, and Merch! articles, or, for your listening pleasure, check out Pardon the Pixie Dust podcast. Special thanks to crack staff photographer Brandon Glover for his invaluable assistance in this article. I would also like to thank Meg (one of the founding members of #PotterWatch, her story of which you can listen on episode 3.2 of the Parkscope podcast), “the better half” @loveleelaura88, @MagisterGermain, @laurenlikesnaps, @FelipeWWoHP of OrlandoUnited, Downtown Disney Historian @Trygve and the usual gang of idiots. 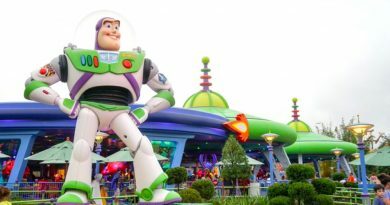 SATURDAY SIX: 6 Reasons We Love TOY STORY LAND at DHS! 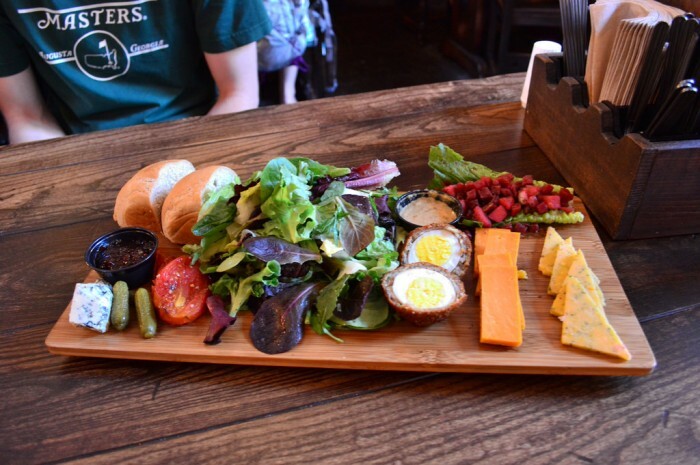 Is The Ploughman’s Platter too much food for a single person who doesn’t eat too much? I can nevel tell from pictures. For one person who doesn’t eat much? Yes. You get a large amount of food. 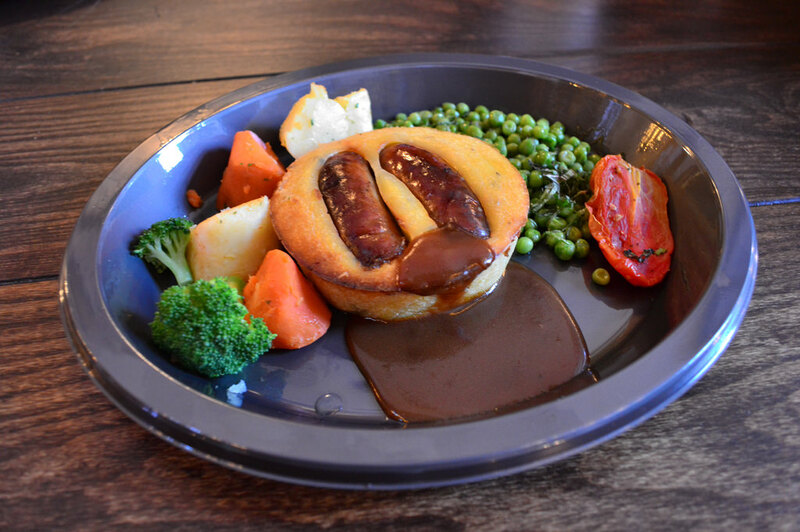 We LOVE toad in the hole, and I make it frequently. If you make it with breakfast sausage and pour maple syrup on it, it’s like a fluffy pancake/sausage combo. I prefer it with dinner sausage and onion gravy, but my kids disagree. The Cheese Ploughman’s looks amazing, though. Not theme park food! I have no idea what that diced red stuff is, anyone? Plus IMHO there should be some thick cut ham or pork pie on there too, with Branston pickle. UK liners will know what that is! I actually had a ploughmans lunch last night out at the local pub. About the same size as shown and could not finish it. DP finished off my cheese! 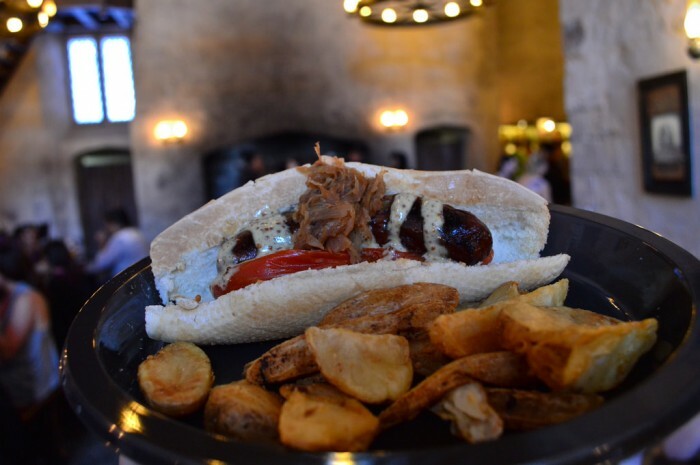 I want to take my family to Leaky Cauldron, but there are a lot of Vegetarians in the group. 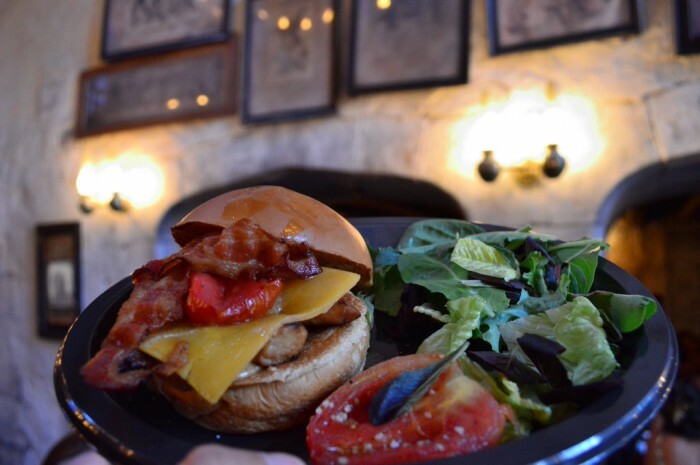 Do you know what substitutions may be allowed? 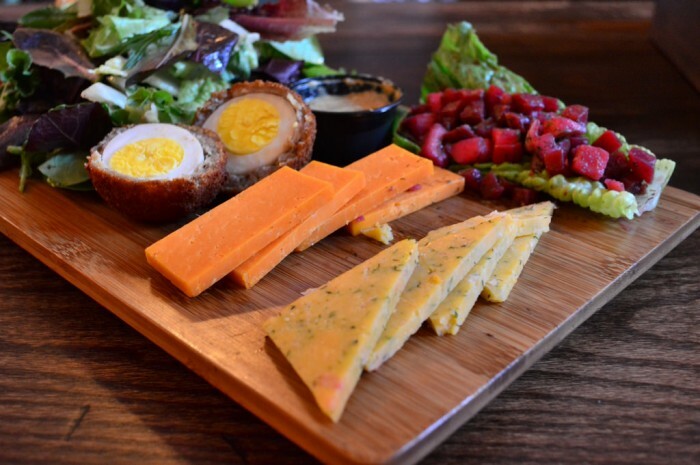 The The Ploughman’s Platter is an excellent value for two non meat eaters to share. I’ll totally try to trade my eggs for more cheese but if I can’t I’ll just chuck it to the bin.